Being thoroughly fed up with the chilly weather conditions last month which precluded my excursions into the country for macro photography, I made the decision to go out on 22 June whatever the weather. When I set out, it was raining but I parked the car at the side of the road from where I could climb over a stile and follow a footpath leading to Devil’s Dyke. I never made it over the stile – the grass verge was teeming with life, I presume, sheltering from the rain and moving about a lot less than in fair weather conditions. 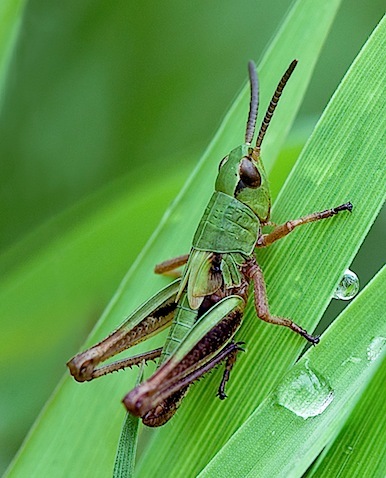 The grasshopper below was shot using a tripod – I often use Wimberley clamps attached to it at one end and the subject’s perch at the other to lessen movement caused by the wind but in this case, the grass blades were near ground level and sheltered by the other vegetation. Nice of the grasshopper to be so cooperative, too. As someone who also tires of chasing insects around gardens and fields, I can sympathize with the difficulty of obtaining a shot like this. Great work. I’ve been inspired but mystified by the amazing clarity and sharpness achieved by other photographers whose work I’ve seen in books and on Flickr. The macro twin-flash I bought last year has helped – though it wasn’t used for this shot. I’m beginning to achieve shots I’m happier with but it’s so difficult! That’s photography though, right? A never-ending quest for improvement and search for the elusive perfect capture. If it was easy, probably wouldn’t be as much fun. Your gallery looks great. Keep up the good work.